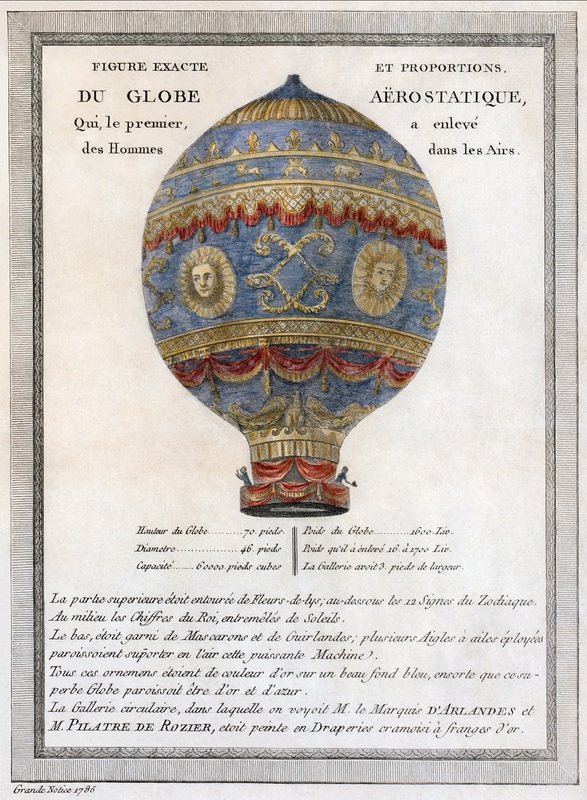 On this day in 1783, the first free flight by humans in a hot air balloon was recorded in Paris, France as Pilatre de Rozier & Francois d’Arlandes flew a Montgolfier balloon to an altitude of 3,000′ and traveled a distance of 9 kilometers during a 25 minute flight. The brothers Joseph-Michel Montgolfier and Jacques-Étienne Montgolfier were paper makers in Paris who noticed that laundry would rise when held over a fire. This observation inspired experimentation with paper boxes & bags which they found would also rise. Their experiments lead them to believe that it was the smoke that made items lift from the ground, a theory about as accurate as the old phlogiston theory of combustion but it seemed to work for them :). They then figured that a really big paper bag over a super-smokey fire would be able to carry people into the air and thus set about to prove it. During the year leading up to the first manned flight they experimented with designs and launched an important test flight on 19 September 1783 with animals on board. The animals were selected with a very scientific approach and included a sheep (much like a human in physiology), a duck (a control item as it’s a flying bird so shouldn’t have been affected by the flight) and a rooster (a bird that’s not used to altitude). If these three survived then it should be OK for humans too. Suffice to say, the three animals survived the flight (and the landing!) so the brothers moved on to a series of tethered lights up to about 100′ off the ground. As these were successful, the crowning moment was the launch of the first manned free-flight on November 21st, 1783. From the early days ballooning was exciting and, as our first form of manned flight, established great volumes of aeronautical knowledge, forming the foundation for much of the aviation that we know & take for granted today. For a balloonatic like myself, today is a special anniversary day as it was thanks to the Montgolfier brothers, to Pilatre & Francois and to those who followed them that I am able to work in commercial ballooning, hold a pilot’s license & get to go fly modern balloons. Sure, they may have changed somewhat since 1783 but many of the concepts discovered over 200 years ago still apply today. 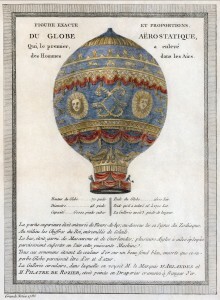 This entry was posted in balloons, Commentary, flying, General Information and tagged 1783, balloon, fire, france, Francois d'Arlandes, heat, Jacques-Etienne Montgolfier, Joseph-Michel Montgolfier, Montgolfier Day, paper, Paris, phlogiston, Pilatre de Rozier, pilot, rises, smoke. Bookmark the permalink.